Blending work and family is a skill that Cheryl Hickey, the long-running host of ET Canada, has fine-tuned over the years. While she’s full tilt in the real mom movement and revealing the beautiful mess of working motherhood on her social media feeds, she’s had to balance the chaos with a high professional IQ to continue her joyful ride. Pamela Kennedy has a rich background in corporate PR working for major beauty brands like Oscar de la Renta, Alfred Sung, Royal Doulton, Smashbox Cosmetics, Estée Lauder and Dr. Roebuck’s skincare. Some she’s worked for full-time and others are clients of PK Communications, a PR shop she started over 12 years ago. Although she’s been wooed to come back full-time by luxe-minded companies, she’s never been tempted to make the switch. Naturally, we had to find out why. Catriona Smart is mastering the art of change. Within the last couple of years, she oversaw a complete home renovation and design project and launched her own PR agency while maintaining her lifestyle blog and events company, Coco & Cowe. She also journeyed through a divorce and is taking her first steps as a single working mom. It’s not enough to say this mom is pivoting…she’s redesigning her life. What does a former club DJ, VJ and news anchor do when she has a gaggle of littles? Well, Monika Deol quit her on-air career to become a full-time mom to four. She’s most widely known as the host of CityTV’s Electric Circus, a live TV dance show that still gets mad props from headlining stars (Champagne Papi, for example, paid homage by wearing a tee with the show’s logo just last summer). It’s been more than 10 years since her on-air life and she’s coming into the spotlight with the launch of her newest baby, Stellar makeup. 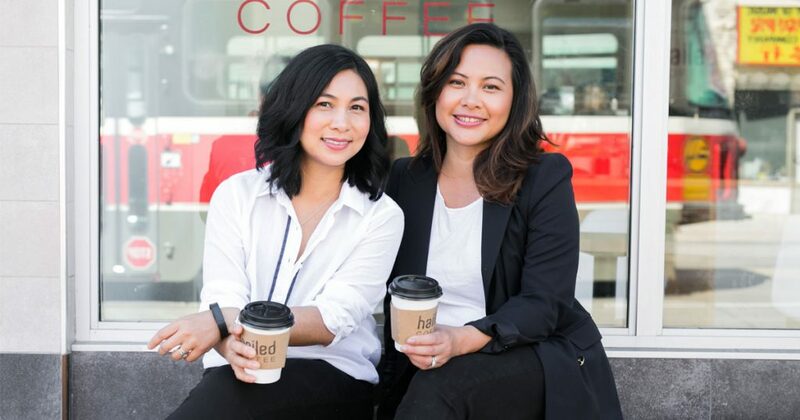 Joanna Track has launched big and exciting digital ventures during her career and now she’s got The Bullet, a daily newsletter that runs down the top news of the day which she personally curates for busy moms like us. With this biz, she’s redefining her journey of entrepreneurship as a single parent and allowing motherhood to inspire her business plan. Hannah Sung is a video and podcast producer at The Globe and Mail and a privilege of her gig was producing a podcast series about race in Canada called Colour Code that shot to the top of the Apple Podcast chart last year. We asked Hannah what she learned on this aural journey for herself, for her kids and for us, too. Debra Goldblatt Sadowski’s PR business is 25-people strong with Adidas, the Juno Awards, Etsy and Club Med as clients and accolades such as spots in the Canadian Business Top 100 Female Entrepreneurs in Canada, and one of the fastest growing companies in the country according to Profit 500. Here she shares positive self-talk that will help make every diaper change, client meeting and any grown-up decision feel like it’s truly meant to be. Bernadette Morra has a long-standing love affair with her work. Her career as a fashion editor and reporter has spanned over 25 years with an impressive tenure at The Star followed by 7 years as the editor-in-chief of FASHION magazine. Quitting her profession was never in her vocabulary after she had her twin sons who are now 18-years old. Her secret? Stop questioning work-life balance and simply accept it with grace and style.